For my piece, I wanted to make something very symbolic. I have created this painting as a tribute to all of the soldiers that have died at the hands of war. The flowers included in this painting individually represent each province and territory of Canada, even if they weren’t all existing at the time of the world wars, they represent the community and unity that our country has. I have included poppy flowers because of their symbolism of war and respect which are worn all throughout this month of November. The small blue flowers are forget-me-not flowers which represent memories and are worn on the 1st of July in Newfoundland in memory of the deceased of World War 1. 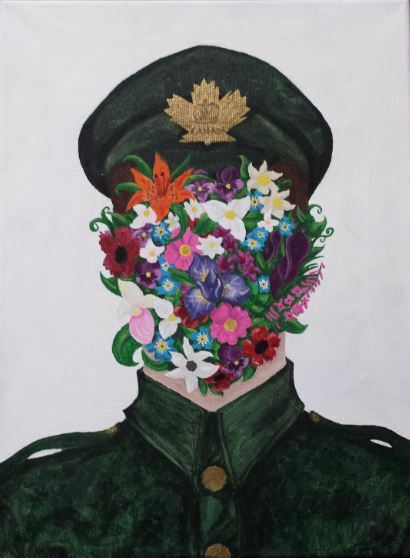 The flowers on the soldiers face are to represent how much war affects the people involved and may sometimes make them unrecognizable physically and mentally. The soldier is Canada’s army as a whole, every single one of the soldiers has been affected and corrupted by the horrific sights of war. The flowers symbolize the beautiful growth, learning and development that have resulted from war.